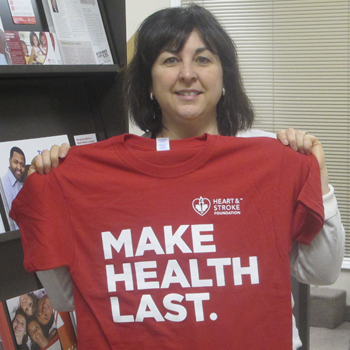 Maureen Corrigan displays one of the Heart and Stroke Foundations t-shirts. The foundation hosts Heart Month, which raises money towards research and eductation on heart diease and strokes. Photo by John Boldrick. Bonita Wannamaker knows just how important her heart is. She’s known all her life. Born with a hole in her heart and a heart murmur, Wannamaker has had to take care of her health. Even now, the 64 year-old resident of the Bayview Retirement Residence tries to keep herself in shape. “I do a lot of walking and exercises in my room,” she said. Wannamaker is one of the lucky one who knows just how valuable her heart is. Many Canadian don’t. That’s why this month is dedicated to the blood-pumping organ. February is Heart Month, put on by the Heart and Stroke Foundation. Its goal is to bring awareness and education to heart disease and stroke. While advances in medicine have shed light on heart health, there are still improvements that can be made. “Right now, unfortunately, we’ve come a long way with heart health but we have a long way to go,” said Maureen Corrigan, area manager for the Hastings and Prince Edward branch of the Heart and Stroke Foundation. Heart problems affect everyone. One Canadian dies every seven seconds as the result of heart disease or stroke. There are 1000 hospital visits per day for the same ailments. Dating back to the mid 1950’s, heart month started out as one day- Heart Sunday in British Columbia. The idea quickly evolved to a national door to door campaign in 1958. Now, some 50 plus years later, the fundraising is still going strong. Last year, the area raised $105,000 in the month of February. In total, the province raised 4.5 million dollars. This year, the stakes are even higher. “We’re looking to do better than we did last year by about $45,000 and I’m positive we can do it,” said Corrigan. In order to reach their goals, the foundation needs help. Currently, they have close to 1200 volunteers to canvas neighbourhoods for donations. While they are satisfied with that number, more help is never a bad thing. Corrigan knows that the volunteers are a big part of the month’s success. She credits them for all the hard work and fundraising they do. Door to door campaigns aren’t the only events scheduled for the month. An auction will be held, featuring Belleville Bulls memorabilia. It will be the foundation’s first auction involving the bulls. Proceeds go towards the Heart and Stroke Foundation. The goal for the auction is $10,000. Other special events, such as pancake breakfasts and potluck dinners put on by area specialty groups, will also be held this month. While they may have set lofty goals, Corrigan said that every donation helps. She said that there are many different ways to make donations. “Everything people can give makes a difference. They can go online and donate, they can give at their door, they can call the heart and stroke office; it just depends how they want to make their contribution,” said Corrigan. Whether they reach their goal or not, the foundation is still about sending the right message. Through donations and the work of volunteers, the month is about improving overall heart health and making healthy choices in life. “It’s all about a healthy lifestyle and making healthy choices and exercise; that’s definitely the best for all of us,” said Corrigan.